Bundhaya Speed Boat started their speedboat services in year 2008 and headquartered in Satun, Thailand. Bundhaya Speed Boat is famous in offering high-speed transfers between the islands off the west coast, as well as the Langkawi archipelago in northwest Malaysia. 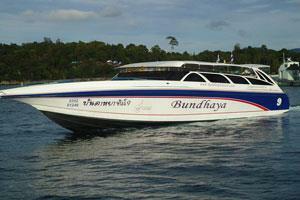 Bundhaya Speed Boat is well-known in providing excellent service for speedboat between Langkawi and Koh Lipe. Moreover, Bundhaya Speed Boat also offers routes covering different places including Pakbara Pier, Koh Lipe, Koh Bulone, Koh Mook, Koh Ngai, Koh Lanta, Koh Phi Phi, and Phuket. Speedboats deployed by Bundhaya Speed Boat are in different sizes and types, depending on the number of passengers boarding the speedboats. The types and size of the speedboats provided by Bundhaya Speed Boat are Speedboat 3-engines that can fit up to 45 passengers and Speedboat 4-engines that can fit up to 75 passengers. For the safety of the passengers, Bundhaya Speed Boat will ensure they have sufficient life jackets in their speedboat for every passenger. 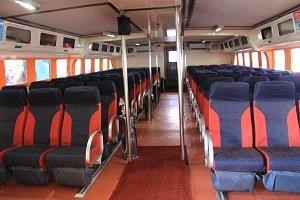 Book your Bundhaya Speed Boat tickets online now with BusOnlineTicket.com!